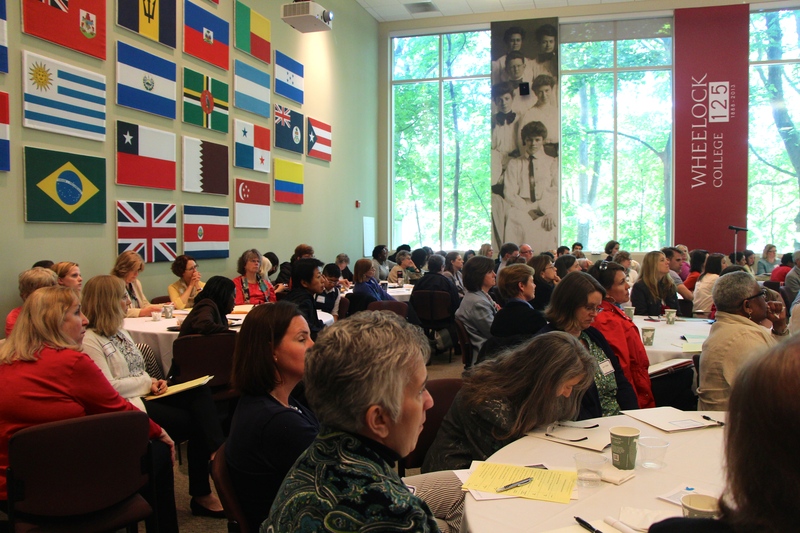 Higgins, the former mayor of Northampton, attended last year’s dialogue; and this year she was joined by advocates, educators, and policy analysts who spoke to an audience of 200 about how best to bring high-quality early education and care to more of Massachusetts’ children. The goal for the day was reinforced throughout the three-hour event: Unite; develop an agenda; and tell a compelling story that will inspire policymakers — especially the next governor of Massachusetts — to commit to a grand plan for improving the commonwealth’s early education and care system. The state’s challenge is that it has made “incremental progress” and “not the seismic shift that’s necessary.” Tom Weber, the commissioner of the Massachusetts Department of Early Education and Care told the audience. He pointed to progress on language and STEM (science, technology, engineering, and math) standards, as well as advances in quality and kindergarten entry assessments. “I measure our success by the budget,” and early education lags behind K-12, Weber said. A is for a field that is largely apolitical: Early education serves children who can’t vote and parents who are mostly only interested when their children are young. E is for expensive: Or seemingly so. Early educators know that their work pays off in the long run by decreasing costly problems such as grade retention and high drop out rates. But the upfront costs of funding universal preschool frighten people off. I is for inaccessible: Too many families can’t afford to pay for high-quality preschool programs. O is for overwhelming: The state’s early education system has multiple providers and varied funding sources. And U is for under-documented: Some of the best studies on preschool programs are decades old. The field needs more fresh research. “Early education and care is important for children, parents, and our economy,” Jeff Bernstein, senior policy analyst at the Massachusetts Budget and Policy Center (MassBudget), explained in his presentation. MassBudget estimates that there are 158,000 3- and 4-year-olds in Massachusetts. Some 51,000 of these children are members of families whose earnings are below 200 percent of the federal poverty line. And 20,000 of these children don’t get any public help paying for preschool programs. What can Massachusetts do to help these kids? Expand high-quality preschool programs. “Now we’ve got to take this energy and drive it into the State House and the gubernatorial race,” Marie St. Fleur said. A former state representative from Dorchester, St. Fleur is now the president and CEO of the Bessie Tartt Wilson Initiative for Children. She argued that companies such as Target, whose workers rely on early education and care programs, should be allies. She also encouraged the crowd to be honest in talking about how expensive it is to care for infants and toddlers. “They’re not doing you a favor,” St. Fleur said of salary increases. These increases help keep early educators in the field and that stability is essential for children. Higher salaries also help stabilize the lives of early educators’ own children. Her warning: The early education field has to come together. School-based preschool programs, family providers, and center-based programs cannot fight amongst themselves. They have to find and agree on a common issue, develop an agenda, and advocate for it. That agenda should be part of the next governor’s platform, St. Fleur said. Otherwise multiple messages will emerge and cancel each other out. “Children depend on dependable people being in their lives,” Mary Clare Higgins said, noting how important it is to pay wages that enable early education and care professionals to remain in their jobs. This is especially true for educators and providers who are working with children who have the greatest needs. Higgins is the executive director of the anti-poverty agency Community Action. Praising Governor Patrick’s plan for early education, Higgins noted that his plan lacked a supportive coalition in the Legislature and in the community. Just as Massachusetts made a commitment to reforming K-12 education, the state could develop a vision and a plan to transform early education. Higgins asked how many people in the audience knew the names of their state senators and representatives, as well as their mayors and school committee chairs. And how many of you talk to them? Higgins asked, noting that these are the people who make key education decisions. Communication is essential, Higgins said, because just as children grow and change through human interaction, so do state senators and representatives. High-quality early education programs aren’t only about preparing the next generation of workers, Higgins said. These programs also give children the fundamentals they need to prosper in a democratic society. Part Two of this blog will run on Monday, June 12, 2014.